Just got an email from Sean Ceglinsky from the LA Times. Darius Morris verbally committed to the University of Michigan today. 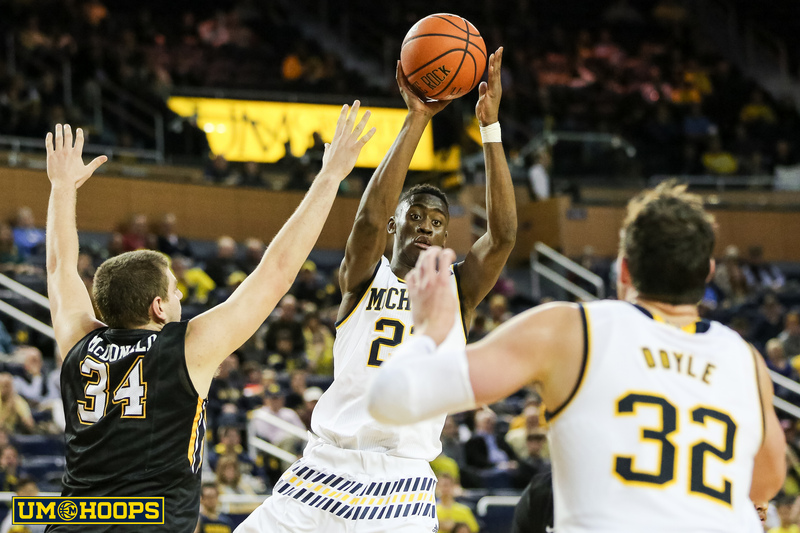 Darius has been the #1 target on Michigan’s recruiting board for some time and is the perfect pass-first playmaking point guard for John Beilein’s offense. Morris’ ranking has fluctuated up and down this summer and will probably change again when the final post-Summer rankings come out on the various recruiting websites. I think Morris’ ranking is somewhat restricted as the summer progresses there are a lot of guys who come onto the radar out of nowhere (think Manny Harris) compared to Darius who has been on the radar for a while. For these “out of nowhere” guys it’s a lot easier leap frog over the already ranked players with one or two good tournaments. Darius is a pure point guard, even at 6’3″+ he is more of a point guard than a shooting guard. Darius is savvy floor leader who is an efficient but not spectacular scorer. He has the length, size, and athleticism to become a very good defender, but AAU ball isn’t really the place where defensive skills are showcased. The knocks on Darius have been pretty consistent. The first is that he forces the issue, and often times get’s too showy and tries to make the fancy play instead of the smart one. The second fault in Darius’ game is his shot; while he has improved his shot over the last year his low release still plagues him. That being said I am not that worried about Darius’ shot right now because looking at Manny’s shot 2 years ago compared to now it’s obvious that Beilein can coach shooting. Just last week Darius was named one of the top 15 players at the RBK Championships by NBADraft.net. Darius Morris scouting report from U-M Elite Camp. Here is what the folks over at BallIsLife had to say about the first time they saw Darius Morris play during his junior year. When I got there it was in the 4th quarter because I had gotten lost on my way there, (didn’t realize the school was so small). Well in that 4th quarter Campbell Hall was leading by nearly 30 points against this team called Windward high school. On the other team there was this long skinny kid who was trying at wits end to go at Jrue on every chance he could get even though he had no chance of bringing his team back for the victory. This caught my attention simply because, Jrue is known for being the best defender in the 2008 recruiting class. Simply put, Jrue shut him down, but Darius Morris never stopped trying. What he lacked in size and a reputable jumpshot he worked on over the next year, making his buzz playing for Dinos Trigonis’ Belmont Shore basketball club all the while playing alongside 2 of the nation’s best guards. He was playing with Brandon Jennings (University of Arizona), and Demar Derozan (University of Southern California). Not only did he play alongside of them, he did not get lost in their shadows, but showed out and gained recognition and confidence in his skills. There is a lot more on Darius at Ballislife including an interview with Darius where he mentions his 3.6 GPA, going head to head with Jrue Holiday, and his goals for this summer. A natural point guard, Darius Morris was most impressive in the way he deferred to Brandon Jennings, Demar Derozan and Roberto Nelson. However, he also found ways to assert himself for Belmont Shores. He hit some timely 3-pointers to keep his team in the hunt during the championship game. When he got the ball in his hands in the open court, he made great decisions. He was consistently able to break his man down on the dribble in the half court. At 6 feet 2, he could still be growing. His feel for the game is outstanding. We expect him to get stronger, a tad more explosive and work his way into being one of the better point guard prospects in the 2009 class. For point guards in the class of 2009, finding the little things to separate themselves is key. For Darius Morris, the thing was rebounding. An inch taller than last summer, Morris was good on the glass and used his good athleticism and length to get on the glass. He started the break quickly after snatching the rebound. Morris scored the ball well and loved to leak out, which will probably be a theme this weekend for most players, and scored on the break quite often. I have seen a lot of people comparing Darius Morris’ commitment to Daniel Horton’s at the start of Tommy Amaker’s tenure. Daniel Horton was a better talent than Darius Morris; Horton was a McDonalds All-American and a 5-star on most recruiting services. I think it would be very hard to craft an argument that Darius is a better player at this time than Daniel was in high school. But the question is whether Darius’ commitment will have a bigger impact. The interesting thing about this comparison is the reputation of both coaches. Amaker was considered a recruiter and landing talents like Horton was expected to be the norm for years to come (He recruited very well ratings wise 4 out of his 6 years at Michigan and landed about 9 top 100 kids). Beilein on the other hand has been constantly criticized for his lack of recruiting triumphs and the under-the-radar 2008 recruiting class. Landing a kid like Morris would prove that Beilein can get it done on the recruiting trail and help to quell these complaints. It’s hard to complain about Beilein’s recruiting when he just went out and got the #1 target on his recruiting board. Pundits will say that Beilein still isn’t recruiting in-state enough or something along those lines. But I still feel that landing a top 10 point guard out of California after a losing season eases a lot of the concerns I had with Beilein’s recruiting. The other positive that is hard to ignore is the domino effect Darius could have on other recruits. Darius has played the summer circuit, played at Michigan’s Elite Camp, and is familiar with a lot of Michigan recruits. There have been rumors that Darius has even been working other recruits to choose Michigan for a while now. The biggest fish out there is Nate Lubick, if facebook rumors are worth discussing then it seems like Nate and Darius talk about Michigan quite a bit. For those that don’t know, Nate Lubick is a top 40 big man in the class of 2010 who lists Michigan in his top 5 along with Virginia, Duke, Georgetown, and UCLA. I am under the impression that Michigan has a real shot at landing Nate and that landing Darius will certainly help. That is certainly starting to look like a team that can compete night in and night out in the Big Ten. While it is still a bit weak inside, imagining a back court of Darius, Laval, and Manny cutting and slashing everywhere is certainly encouraging. Especially when you throw in a few guys who can stroke the three ball like Stu and Zack. The 09 recruiting focus shifts to the 3/4 position from here and then on to 2010.Â I’ll update the hot board next week but two names that have been discussed a lot as wings are Givon Crump and Roger Franklin. If you add one of those two to this class along with Darius and Jordan it is starting to look like a pretty good class for someone who supposedly can’t or won’t recruit. Beilein himself says he “secretly loves” recruiting and landing Darius is a nice reward for not taking a July vacation. I for one will be counting down the days until Darius puts on the Maize and Blue.